This article was originally published at Carbon Brief by Robert McSweeney, and has been praised by scientists as a nuanced summary of the research on this topic. The past week has seen some brutal weather hitting the US and Canada. With cold Arctic air plunging south down to the US midwest, six states have seen temperatures lower than the south pole and at least eight people have died due to the extreme cold. The UK, too, is braced for snow this week, but nothing close to the scale seen in the US. Trump’s comments received widespread derision from scientists and the media, with many articles pointing out that Trump is confusing short-term weather events with long-term climate, and that extreme cold weather still occurs in a warming world. The cold, snowy weather has also been accompanied by a flurry of stories about the “polar vortex” and how it can bring extreme weather to the northern hemisphere mid-latitude regions of North America, Europe and Asia. But that is not the only way that the Arctic can affect conditions further south. Over the past decade or so, a growing body of research has proposed ways in which rapid Arctic warming can lead to harsh winters, summer heatwaves and even floods and droughts across the mid-latitudes. Some scientists say that climate change and Arctic sea ice loss are the root cause of these events, but others are more circumspect. In this detailed Q&A, Carbon Brief speaks to scientists about the potential connections between Arctic warming and extreme weather across the mid-latitudes, what those theories look like, and how the evidence measures up. Late summer and early autumn have seen the largest declines in Arctic sea ice cover. 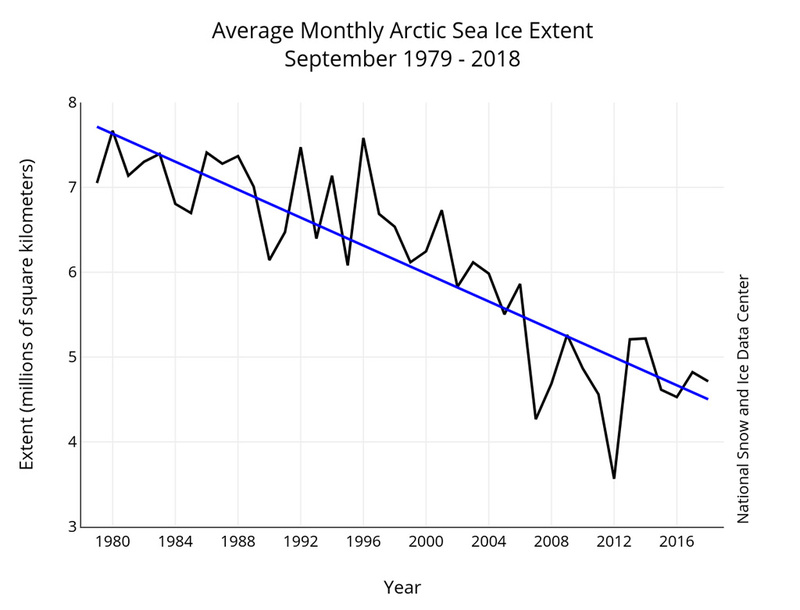 Average September sea ice extent, for example, has decreased by around 13% per decade since 1979. Recent research has suggested that these rapid changes in the Arctic could be having knock-on impacts further south. While a warmer Arctic Ocean further inhibits sea ice growth, it also generates warmer and more moist air masses over the Arctic and nearby continents. A warming Arctic also reduces the temperature difference with the mid-latitudes, which has consequences for circulation patterns in the atmosphere (more on this later). The theory goes that these changes contribute to an increase in unusual and extreme weather across the North America, Europe and Asia. Research has tended to focus on an Arctic connection to extremely cold winters, such as a doubling of the likelihood of severe winters in central Eurasia and the prolonged very cold spell during the 2013-14 US winter, which saw 91% of the Great Lakes freeze over. However, the impact of Arctic warming has also been linked to summer heatwaves, such as Russia in 2010, and summer droughts in the US. Some scientists have taken this a step further to propose that warm periods in specific areas of the Arctic can affect particular parts of the mid-latitudes. For example, a 2015 Nature Geoscience study found that warmer-than-average temperatures over the Barents-Kara Sea region and the East Siberian-Chukchi Sea region tend to lead to cold winters across East Asia and North America, respectively. The theory seems counterintuitive – particularly the idea of more extreme cold winters in a warmer climate. But it is important to note that while one country or continent might see a short-term blast of very cold conditions, the world as a whole is still warming. The map below shows how temperatures on 31 January 2019 across the world compare to the long-term average. Map of global temperatures for 31 January 2019, shown as anomalies from a 1979-2000 baseline. Map is generated from the NCEP Global Forecast System (GFS) model by Climate Reanalyzer, Climate Change Institute, University of Maine. However, while it is generally accepted that there is correlation between a warming Arctic and mid-latitude weather, some scientists argue that causation has not yet been proved. In other words, while the two might be connected, scientists cannot yet be sure that a warm Arctic is directly causing the sort of extreme weather the US has been experiencing this week. The earliest modelling study to investigate the links could be a 1978 paper in Monthly Weather Review by a pair of Nasa scientists, says Screen. The study used an early climate model to show that sea ice changes are “capable of altering local climates in certain regions of the high and mid-latitudes”. In 2005, Dr Judah Cohen, director of seasonal forecasting at Atmospheric and Environmental Research (AER), along with his colleague Matthew Barlow, authored a Journal of Climate paper that proposed a connection between climate change, declining Arctic sea ice and a negative phase of a natural fluctuation called the Arctic Oscillation. However, it was not until this century that the topic emerged beyond a niche research area. The dramatic declines in Arctic sea ice in 2007 and 2012 caused an “explosion of interest”, says Screen. A 2007 Journal of Climate study of how the atmosphere responds to sea ice and sea surface temperature changes in the Arctic is “a modern classic”, says Dr Tim Woollings, a lecturer in physical climate science at the University of Oxford. While a 2009 Geophysical Research Letters paper by Japanese scientists investigated the “influence of low Arctic sea ice minima in early autumn on the wintertime climate over Eurasia”. In terms of the current discussion on links between a warming Arctic and mid-latitude extremes, the first paper is probably a 2012 Geophysical Research Letters paper by Prof Jennifer Francis of Rutgers University and Dr Stephen Vavrus of the University of Wisconsin-Madison, says Woollings. As Francis explains to Carbon Brief, her paper was “the first to propose in broader terms the impact of Arctic amplification on a variety of extreme weather, which is why it received so much attention when it was published”. Since then, there has been steady stream of papers proposing how warming in the Arctic can bring extremes to the mid-latitudes. 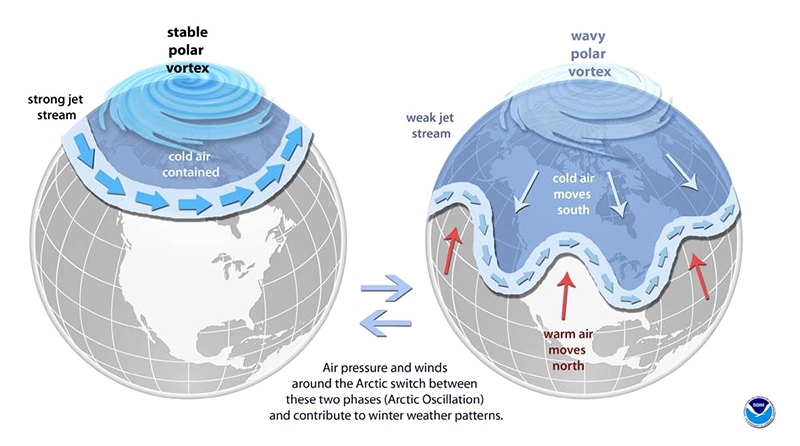 The different theories of how Arctic amplification could be affecting the mid-latitudes fall broadly into three main categories: those that focus on a “wavier” jet stream, the stratospheric polar vortex and “wave resonance”. The first theory focuses on the troposphere – the lowest layer of the atmosphere where the vast majority of the day-to-day weather occurs. In particular, it concerns the polar “jet stream” – a band of fast-flowing air high up in the atmosphere. The jet stream is a year-round feature of the weather in the mid-latitudes. In the UK, for example, if the jet stream path shifts to the south, it pulls down cold air from the Arctic. When it sways north, it brings warm air up from the tropics. These diversions from its path increase the likelihood of a wavier jet stream pattern, says Francis. When the jet stream takes larger north-south meanders – known as “Rossby waves” – warm air can penetrate north and cold air can plunge south. Larger waves also mean the systems moving from west to east tend to travel more slowly, “effectively making weather conditions more persistent”, says Francis. The video below, made by the Aspen Global Change Institute, provides a neat illustration of this process. Another, related mechanism focuses on “storm tracks”. These are the relatively narrow paths over land and sea through which storm weather systems tend to be pushed by prevailing winds. In the northern hemisphere, the position of storm tracks is affected by a natural fluctuation known as the North Atlantic Oscillation (NAO). This describes the extent of the difference in air pressure between the high pressure sitting over the Azores, to the west of Portugal, and the low pressure over Iceland. When the NAO is “positive” – and the pressure difference is stronger than usual – storm tracks shift towards the poles, bringing milder air to North American and Eurasian winters and leaving the Arctic very cold. When it is “negative” – and the pressure difference weakens – storm tracks shift towards the equator, and winters in northern Eurasia and eastern US tend to be more severe, while the Arctic is relatively mild. This is often referred to as the “warm Arctic-cold continents” (WACC) pattern. 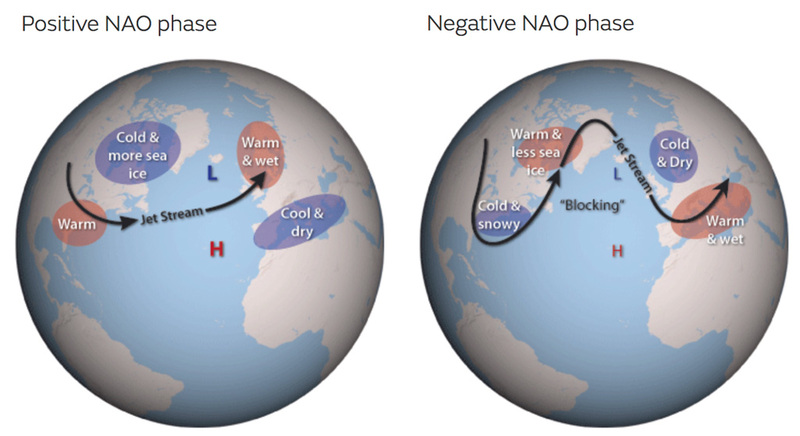 While the NAO is naturally highly variable, some research has suggested that it has become increasingly negative over the past two decades because of diminishing Arctic sea ice cover – meaning cold winters are more common. This is illustrated in the map below, which shows the trend in winter temperatures between 1990 and 2013. 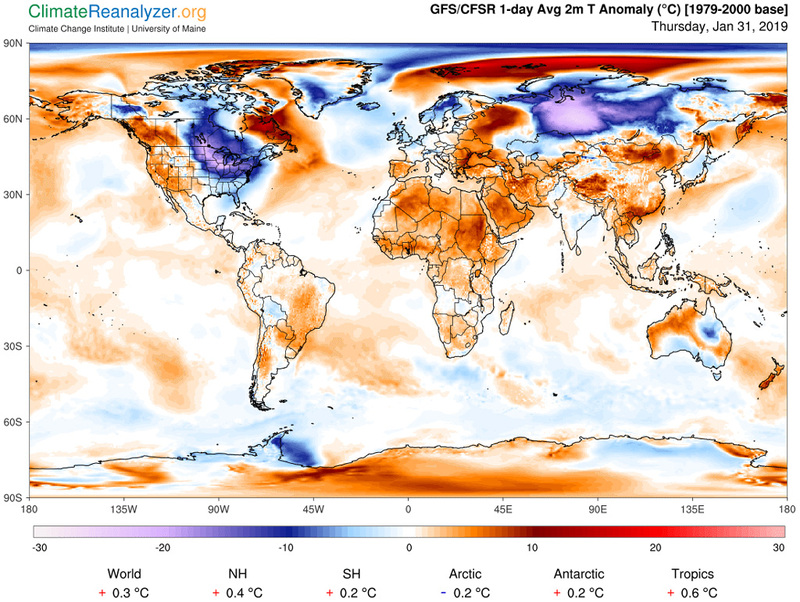 The red shading shows the substantial warming over the Arctic, in stark contrast to the cool blues over Eurasia and the US. The second mechanism is a feature of the stratosphere – the layer of the atmosphere above the troposphere. This layer is home to the “stratospheric polar vortex”, which has been the focus of much of the recent news coverage about the extreme cold weather in the US. The stratospheric polar vortex is a low-pressure weather system that sits around 50km above the Arctic. (There is an equivalent one over the Antarctic.) Its main feature is the strong west-to-east winds which encircle the north pole. These winds are known as the “polar night jet” because they only appear during the dark Arctic winter. As with the jet stream in the troposphere, the polar night jet forms a boundary between the very cold Arctic air and the warmer air over the mid-latitudes. However, if something disrupts the stratospheric polar vortex it can weaken, reverse direction and even split into two. This can trigger a sudden stratospheric warming (SSW) event where air collapses in over the Arctic, causing a spike in temperatures in the stratosphere – by as much as 50C in just a couple of days. 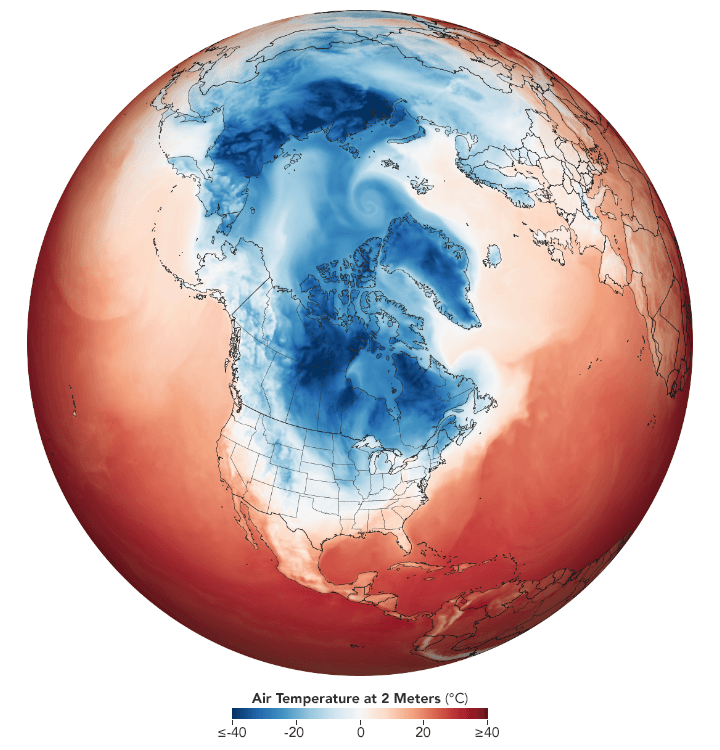 The animation below from Nasa shows how the cold Arctic air has plunged south over the US over the past week. SSWs are not a new phenomenon. They typically occur every other year, although their frequency fluctuates from one decade to the next. Research published last year in Atmospheric Chemistry and Physics suggests there is “no robust evidence of future changes in major stratospheric sudden warmings” during the 21st century. The trigger for a SSW event is usually a natural weather pattern or disturbance in the troposphere. For example, a common source of these disturbances is variability caused by the El Nino-Southern Oscillation (ENSO). A 2014 Nature Communications study, led by scientists in South Korea, suggested that low sea ice cover in late autumn in the Barents-Kara seas region of the Arctic could make these disturbances more likely – the impacts of which then play out in the northern hemisphere winter. And a 2018 study, led by Dr Marlene Kretschmer at the Potsdam Institute for Climate Impact Research (PIK), found that periods of a weak polar vortex during January and February have increased over the past 37 years. Around 60% of cold extremes in mid-latitude Eurasia during this time could be explained “by the increased frequency of weak stratospheric polar vortex”, the paper concluded. 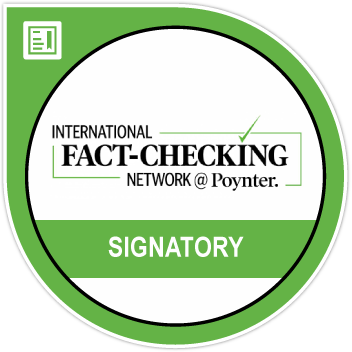 Kretschmer told the Washington Post when the study was published that the findings match with the “hypothesis that the Arctic does have an effect and that climate change – leading to a decrease in sea ice – has an effect on large-scale circulation, in this case the stratosphere”. A third type of mechanism, known as “wave resonance” also relates to the jet stream in the troposphere, but only occurs during summer. It is suggested to have played a role in the 2003 European heatwave, the 2010 Pakistan floods and the 2011 Texas heatwave. First proposed by a group of scientists from PIK in a 2013 study published in the Proceedings of the National Academy of Sciences (PNAS), the theory suggests that a weakened jet stream increases the likelihood of it splitting into two distinct jets. One jet then moves north and the other south, potentially trapping weather systems in between. This “quasi-resonance” results in persistent – and often extreme – summer weather. The theory of “quasi-resonant amplification” (QRA) has been further analysed in several more recent papers. A 2017 study in Scientific Reports, for example, identified a “fingerprint” of the conditions that favour a QRA event. Using climate models, the researchers say they can show that human-caused climate change makes these conditions more likely, which is “is mirrored in multiple observational surface temperature datasets”. And a Science Advances paper, published last year, found that QRA events could become 50% more likely this century under a high emissions scenario. The video clip below, PIK research associate Dr Kai Kornhuber explains the QRA theory in more depth. What are the criticisms of the theory? As the number of proposed theories shows, this is a complicated picture without a clear-cut answer. This uncertainty means some scientists have misgivings about the strength of the links being proposed. It is physically plausible that global warming will make the polar jet stream more unstable and lead to more Arctic outbursts. However, overall winters are getting warmer, and I don’t really see evidence on-the-ground (so far) that long-term trends in cold spells are any worse. To show causation, scientists need to replicate what is happening within climate models, says Screen – running simulations with and without the influences of Arctic amplification and human-caused climate change to see the impact they’re having. (This is what attribution studies do.). For example, a 2016 study in Geophysical Research Letters used multiple models to assess whether the “warm Arctic-cold continents” (WACC) pattern was being forced by Arctic sea ice decline and human-caused climate change more widely. The findings suggested that “neither sea ice loss nor anthropogenic forcing overall yield trends toward colder continental temperatures”, the authors said. The researchers concluded that the WACC pattern was instead a result of natural variability. They did identify an impact of declining sea ice on high latitude weather – although this was a trend towards less variability and fewer cold extremes. Similarly, a 2016 Nature Geoscience modelling study investigated the links between Arctic sea ice loss and winter temperatures over central Eurasia over the past 25 years. The results showed “no evidence of Arctic sea ice loss having impacted Eurasian surface temperature”. The authors also pointed their collective finger at natural variability as the cause. This could be a result of models underplaying some features of the global climate, she suggests, such as atmospheric circulation changes and the full extent of Arctic amplification. While the observed extremes in the mid-latitudes could be down to natural variability, Francis argues that it “seems improbable that the Arctic could lose half of its summer sea ice extent…during the last few decades – without affecting the large-scale circulation”. This leaves scientists in something of a catch-22 situation: they cannot definitively prove a causative link between Arctic amplification and mid-latitude extremes without climate models, but if models are not fully representing the climate processes involved, they will not simulate a robust link. Why is there uncertainty around the theory? That there are so many theories of how Arctic amplification affects mid-latitude extremes suggests “it’s really not obvious what’s going on”, says Tim Woollings. One of the main issues is that “we clearly don’t have enough data to be able to tell which of these theories, if any, is correct”, he notes. The “signal” of human-caused warming in observed data for the Arctic has only emerged out of the “noise” of year-to-year natural variability over the past couple of decades. This provides a relatively short period to analyse. As there is so much variability inherent in the weather, it makes it hard for scientists to identify a robust statistical link. Cohen suggests that shortcomings in current models mean they “do not properly simulate or represent coupling of the surface and the atmosphere correctly in the Arctic”. However much of a role Arctic amplification plays in mid-latitude extremes, it is also clouded by other processes having an influence on the weather. For example, a 2013 study in Geophysical Research Letters suggested the link might go the other way. This involves events where large-scale circulation patterns in the mid-latitudes transport a lot of warm, moist air into the Arctic, causing high winter temperatures. The researchers identified almost 300 of these events between 1990 and 2010, which accounted for 28% of all the moisture being shifted into the high Arctic. Could a definitive link emerge in the future? As a 2015 WIREs opinion paper by Dr Elizabeth Barnes of Colorado State University and James Screen concluded, the “jury is still out” on whether a rapidly warming Arctic is having “tangible implications for weather in lower latitudes”. While there is growing consensus that the Arctic can influence mid-latitude weather, the paper says, this “neither implies that it has in the past, nor that it will in the future”. Screen suspects it will turn out to be the latter, and “that the models are telling us something useful and the observed trends/correlations are primarily incidental and not caused by Arctic sea ice loss”. It is clear that this debate will continue to play out on the pages of scientific journals in the coming years. In the meantime, it is likely that the topic will keep on rearing its head when extreme weather events strike and presidents make comments via Twitter.